Rashila (Radha) is an Experienced 200hr and 500hr Registered Yoga Alliance Teacher as well as a certified Sri Dharma Mittra Yoga Teacher. She gained her 200hr Training through the amazing teachers at Sonic Yoga Centre in NYC, and then continued to excel onto her 300hr with the Guru himself, Sri Dharma Mittra whom she currently studies and practices under. 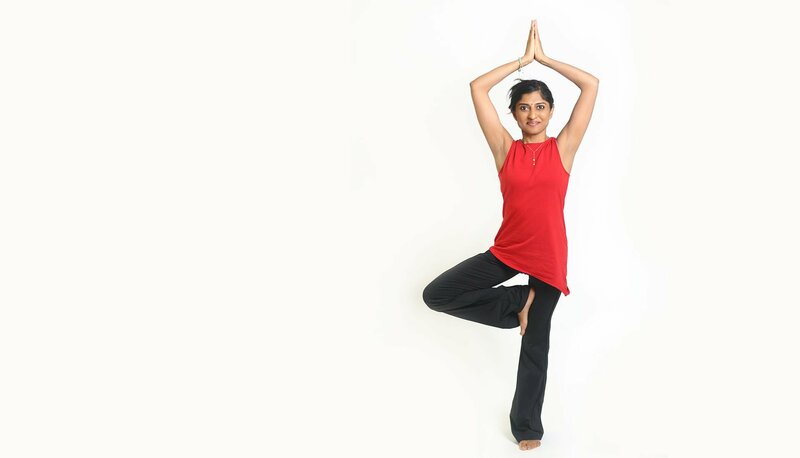 She has additional experience with the Sivananda practices as well as other Vinyasa styles. Her passion in the field of yoga takes her to constantly read, observe and practice with renowned Swami’s and Rishis in India as well as teachers close by so that her teachings are one of a classical authentic nature. Her own yoga journey started when she was a little girl. Being brought up in London into a household of staunch Lord Swaminarayan Hindu spiritual parents, Meditation and Bhakti yoga was already strongly embedded in her lifestyle. Therefore, Mantra chanting, breath work and an astute focus on the Buddhi centre (3rd Eye) is very visible when you are on the mat with Rashila. Ahimsa, Love and Compassion sets the foundation for all her teachings. She is an avid animal lover and follows a vegetarian/vegan diet since her birth. This is what you will see in her classes, the natural formation of breath and meditation along with a powerful asana practice. She will encourage you to push beyond your boundaries both physically and mentally so that you too can evolve into a place of “Supreme Connection to the Universe”. Raja Yoga and it’s 8 Limbs of Yoga is the method of her teachings. Rashila wants to change her students lives to one of quality, humility and healing so that you, the student develops an all pervading awareness free from judgements and self pity. Yoga has proven to be a powerful tool that promotes human progress into self realisation. This is a tremendous benefit that yoga gives us. A life long lesson, not something achieved in a day or a year or decade. Let her classes lead you to the importance of why we need Yoga in our lives even more urgently in these modern times. A solid, ancient, time prevailed way of living now very, very present and made popular in the millennium era by the West! Oct 2016 – March 2017 (Graduated): 100hr Advance Yoga Psychology Training with the Nalanda Institute, NYC. Rashila is always diligent with her Swadhayaya (Self Study of scriptures and Life experiences of herself and those of Seers and Sages). 200hr Science of Self Graduation. Sept 2017 ; 200hr Science of Self – Rose Erin Vaughan and Yoshio Hama. The 3rd Limb in Patanjali’s eightfold path of Ashtanga, Asana is a physical practice to keep the body healthy and vibrant. “Keep the joints moving every day” is what Rashila’s teacher Sri Dharma Mittra told her. So that is her practice, to use the body as a vehicle for spiritual development. Keeping the body flexible and strong will allow us to be rewarded with energy, discipline and focus. In her classes, you will be met with a very thought out, well-planned yoga sequence that has worked alongside the Vayus (Wind Elements) and the Koshas (Sheaths) into the flow, so that you leave the practice rejuvenated and conditioned. Extension of the Prana (breath or life force) is the 4th Limb in Patanjali’s eightfold path of Ashtanga. This practice is yogic breathing exercises and controlling it through specific techniques and rhythms realised by ancient sages, we come to a place with an awareness of the breath, being present and concluding to overall calmness. Through skilful use of the breath, we can actually change our emotional state. You are reminded often to come back to the breath and Just BREATH during her classes. Prana flows through thousands of subtle energy channels that are called ‘nadis’ and energy centers called ‘chakras.’ A good Pranayama practice will evoke these channels and when practiced properly through strict guidance leaves the practitioner with a sense of joy and bliss. The 7th Limb in Patanjali’s eightfold path of Ashtanga yoga, is probably the hardest one to really accomplish and master. Asana, Pranayama and the Limbs in between them gears us up for meditation to be successful and mind blowing. Meditation is focusing the mind to be quiet and serene so that we can be fully present in this moment. It is one of the most effective forms of stress reduction and has the potential to improve the quality of your life. With a history spanning over several thousands years, no wonder meditation is growing more and more rapid in modern age. Asana was created as a seated posture thousand of years ago initially for us to sit quietly and connect body, breath and mind and simply meditate on the divine. Then, to move away from body, breath and mind where the thoughts empty and all that you experience is the consciousness. Full complete transcendental awareness. Most meditation classes guide you through meditation techniques so that you can become familiar of letting go and just BE!